Earlier this year, with the hot summer months fast approaching, the ITER Remote Handling & Radwaste Management Division accomplished a major milestone with the successful completion of the Conceptual Design Review for one of the principal processes of the ITER Hot Cell Complex: the Type B waste (medium activity) processing systems and in-vessel component refurbishment systems. 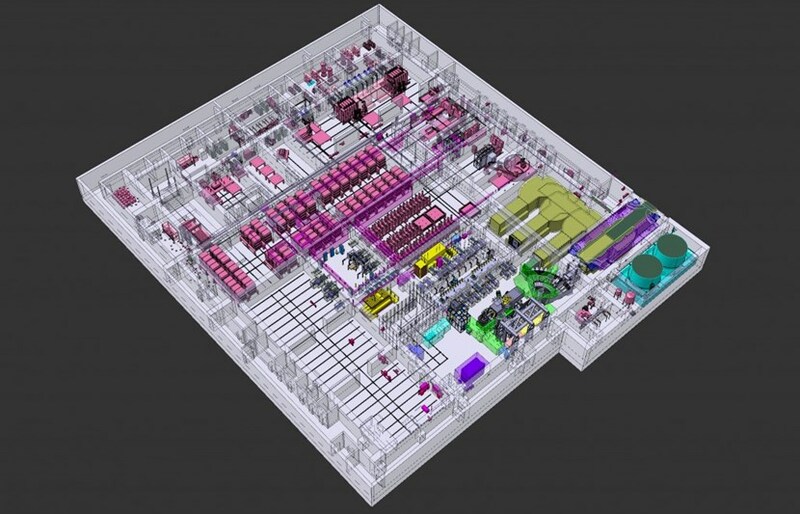 All processing, repair, refurbishment, and testing of components that have become activated by neutron exposure will take place in the ITER Hot Cell, where remote handling systems will be capable of handling components up to the size of a school bus. Pictured here: the basement level of the five-level Hot Cell facility. The ITER Hot Cell Complex supports the operation, maintenance and decommissioning of the ITER Tokamak. The complex consists of three facilities: the Hot Cell itself, the Radwaste Facility and the Personnel Access Control Facility. Together, they provide a secure environment for the processing, repair or refurbishment, testing, and disposal of ITER components that have become activated by neutron exposure. Materials can also become contaminated by beryllium, tungsten and stainless steel dust, along with tritium. The success of ITER will depend to a great extent on developing reliable and safe methods of carrying out routine maintenance and repairs remotely. The in-vessel components of the ITER Tokamak are removed and transferred to the Hot Cell building by remote handling equipment. This group of components includes port plugs, cryopumps, divertor cassettes, and blanket modules. Within the Hot Cell Facility, heavy duty cleaning and refurbishment operations on these in-vessel components will be performed by remote handling systems capable of handling components up to the size of a school bus. "The ITER refurbishment area will be unique in the world, when considering the combination of size, quantity and complexity of operations in the presence of radiation, activated dust and tritium," explains Jean-Pierre Friconneau, in charge of the development of the remote handling systems in the Hot Cell Complex. Tritium recovery and the characterization of the type B radwaste is carried out in this part of the Hot Cell. 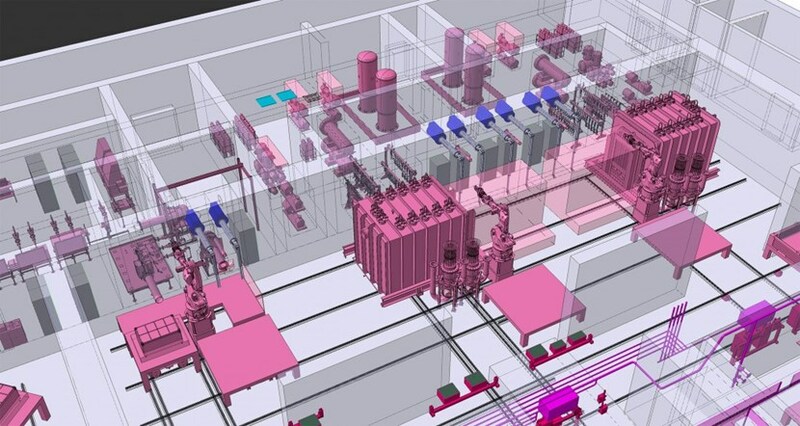 Two detritiation furnaces (large blocks, in pink) are set up near a packaging and sampling station, a laboratory, and a gas treatment system (moving clockwise from the furnaces). The Hot Cell Facility will also house remote handling equipment for simulation and rehearsal of operations. In addition, the Hot Cell Facility will perform the recovery of tritium from tritiated components and materials. This operation will be housed in a safe, confined, and shielded area containing analytical systems for tritium measurement, and a detritiation system for gaseous streams in order to minimize releases and waste. The aim of the three-day design review, during which presentations were made to a panel of expert reviewers, was for the design team to explain the many design drivers and challenges that require strong, robust and cost-effective design solutions to be developed for the medium activity radwaste treatment and the remote refurbishment of the in-vessel components. Safety is, of course, paramount for us all and this is ingrained in all design activities. The proposed solutions were shown to be feasible, well-engineered, substantiated and justifiable with the purpose of ensuring safe and consistent operations and the promise of a safe future legacy, post operations. A major challenge for the ITER Project is to develop and implement a remote maintenance system that can ensure a high level of Tokamak availability within the constraints of the overall ITER program objectives. Much of the maintenance in ITER will be performed using remote handling methods, and some with combined manual and remote activities working together. The organization and management of the ITER remote handling facilities will be of a scale unlike any other remote handling application in the world. The success of ITER maintenance requires a high level of coordination for design activities going on across the world. This requires the establishment of rationale and priorities for management controls and standards affecting the three key elements of ITER remote maintenance: ITER plant remote handling compatibility, the remote handling equipment itself, and remote handling operations. "Even if the maintenance of the ITER machine is very specific, as much as we can we want to benefit from the experience and lessons learned in existing nuclear fission facilities that have been operating for decades," explains ITER engineer Christopher Reeves, in charge of the development of the medium activity radwaste process. "Each time we are using a proven approach and solution, we have the benefit of dozens of years of experience in terms of safety, qualification of risks, and cost." But there are key differences between fission and fusion: nuclear fuel rods weigh kilograms, while ITER's in-vessel components weigh many tonnes. So, it is a real challenge to remotely detritiate components in large furnaces approaching 1,000 degrees Celsius, and reduce the size and volume of the waste in order to fit it into "packages" that can be stored for a time within the facility before being sent to the Host country for final disposal. Remotely operated systems are required to handle and manage the varied waste streams, with substantial weight and reach capacity and with high dexterity. These systems, along with more traditional through-the-wall powered manipulators, work together with more conventional tooling and machinery and integrate with other newer, emerging technologies. The Type B waste processing facility will operate for many years past the operational life time of the Tokamak itself and so the systems need to be highly reliable, durable, resilient and—if necessary—capable of being removed for maintenance or remotely recovered should that be required. With the success of this Conceptual Design Review, a significant step has been achieved as it provides a first baseline description of the maintenance processes hosted within the Hot Cell. The review has given a strong level of confidence and assurance that ITER can safely and successfully manage the Tokamak waste streams in an effective and efficient manner. Accordingly, the design of in-vessel components will have to be fully compliant with the ITER remote handling maintenance requirements and the suite of remote handling tooling and services available in the Hot Cell Facility.